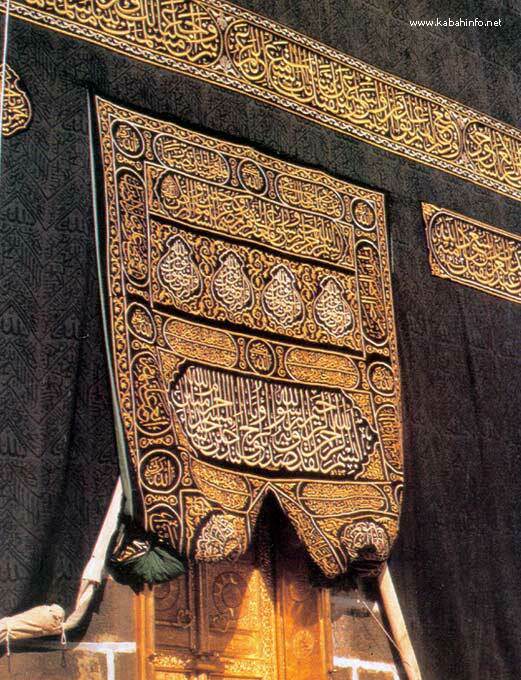 The kiswah of the Holy Ka'bah is the decorative cloth covering. The kiswah of the Holy Ka'bah has passed through several stages since the construction of the Holy Ka'bah by Abraham and Ismail (peace be upon them). This was due to various social and economic factors. Covering the Holy Ka'bah with various materials has always been done with the aim of glorifying it and obeying Allah, the Almighty. There are various stories about the first person who furnished the Holy Ka'bah with a kiswah. Some scholars state that Ismail (peace be upon him) was the first person to cover the Holy Ka'bah with a kiswah. Others state that Adnan Ibn Id, the great grandfather of the Messenger of Allah (blessings and peace be upon him) did it. It is certain that Tubba' Al-Himairi, the King of Yemen, was the first person to cover the Holy Ka'bah with khusuf. Several other persons followed in the pre-Islamic period. This was one of the pre-Islamic religious obligations. Since the reign of Muhammad Ali Pasha, who established a government administration for manufacturing the kiswah, the Egyptian Government used to finance the cost of manufacturing the kiswah. This continued until the reign of King Abdul Aziz Bin Abdul Rahman Al-Saud (may his soul rest in peace), who issued an order in 1346 H. to establish a special factory in Makkah AI-Mukarramah for the manufacture of the kiswah of the Holy Ka'bah. The factory was inaugurated in the middle of the same year. The first kiswah was produced and this great honour was bestowed upon the Kingdom of Saudi Arabia. The factory continues to produce the kiswah of the Holy Ka'bah. To keep abreast of the tcxtile industry and technology, King Faisal (may his Soul rest in peace) issued a royal decree in 1392 H. to technically develop the kiswah factory to produce the best and most beautiful kiswah at Umm AI-Jud in Makkah AI-Mukarramah.It was inaugurated by the Custodian of the Two Holy Mosques, King Fahd Bin Abdul Aziz, when he was Crown Prince, in Rabic At-Thani, 1397 H. - March 26th, 1977.